Those who listen to an audio recording often experience what I call “you had to be there” moments. A you had to be there moment happens when the listener realized that only a visual and the connection that comes with sharing this experience while in the company of other members of the human family will make this moment complete. Gospel music probably has more of those you had to be there moments than any other genre. That is because a gospel concert is essentially a church service, and you need to be in the company of other believers to capture the total spiritual experience. 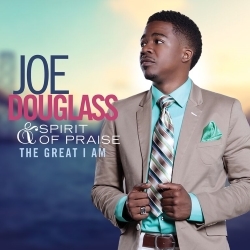 Still, there are plenty of qualities that translate quite well when listening to recording of a gospel concert such as Joe Douglass & Spirit of Praise’s The Great I Am. The youthfulness and ease at which this group can transition into a variety of sub genres of gospel/Contemporary Christian music comes through on “Stay In It,” a track that fuses the jargon and cadences of hip-hop infused R&B with Contemporary Christian instrumental arrangements and an Christian inspirational message. The strong ensemble singing of the choir, as well as the power packed vocals of Spirit of Praise vocalists come through in the traditional blues-infused gospel of “God Will,” while the high quality musicianship is a constant theme throughout the 14 tracks on The Great I Am. Then, there are the instances – such as when Chrystal Rucker calls on the audience to lift their hands toward the end of the praise and worship song “Grace” – that cannot be fully captured on a CD or digital file because those are communal expressions of spiritual thanksgiving. Still, plenty of the powerful voices, excellent musicality and of course religious zeal come through the speakers on The Great I Am, and listeners will be entertained and inspired by the musical ministry of Joe Douglass & Spirit of Praise. Recommended.